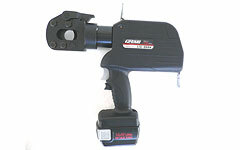 LIC-S524 Battery Operated Cutter Lithium Ion Tools: Izumi Products. NEW "Rapid Action" . New Environmentally friendly Lithium-ion battery - light weight - no memory effect. New Slide in battery insertion gives a more secure connection with the tool. 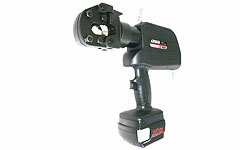 The LIC-S524 has twin stage hydraulics for rapid ram advance. With the pull of the trigger, you can cut ACSR conductors up to 24mm, guy wires to 20mm, wire ropes to 22mm and ground rod to 16mm. The rotating head provides exceptional ease of use and manoeuvrability in tight working quarters. BP-14LN - BATTERY PACK, CH-25LNW - MULTI-VOLTAGE BATTERY CHARGER, Double moulded carrying case.